RadioSpirits.com - Sgt. 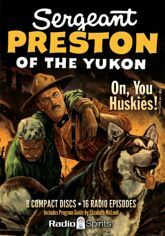 Preston: On, You Huskies! Sgt. Preston: On, You Huskies! "On, King! On, you huskies!" That clarion call brings to mind a blizzard of images for those who grew up with radio -- icy cold, driving snow, and howling winds. Cutting through the Arctic storms we see a dogsled manned by that stalwart figure himself, Sergeant Preston! And, perhaps even more vividly than we see the bold, red-coated frontier lawman, we see his dog, the handsome, courageous, and powerful Yukon King! Paul Sutton brings a combination of authority and manly self-confidence to the role of Preston through 16 previously unavailable digitally remastered episodes. When he declares, at the end of each episode, "This case is closed," it is with the rugged earnestness of one who knows the job is done!